MORE than 100 people in Donegal are diagnosed with lung cancer every year, new figures show. And they show that over one-in-three people who display three or more lung cancer symptoms are "unconcerned" about the disease. 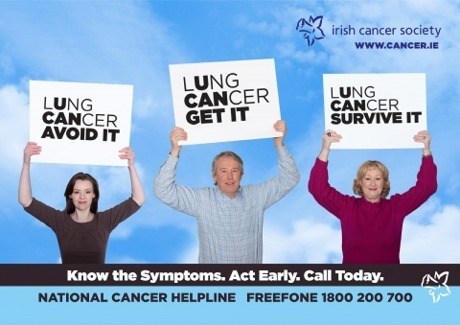 The Irish Cancer Society, which launched a new survey today, said lung cancer continues to grow in Ireland with 103 people diagnosed with the disease in Donegal out of 2,312 cases nationally in 2012. The latest report also reveals a number of barriers to vital early detection of lung cancer. The society said this includes a lack of awareness around the severity of the disease and a third of people being "unconcerned" despite having lung cancer symptoms. Symptoms include a cough that doesn’t go away; shortness of breath; repeated chest infections that don't clear up with antibiotics; coughing up blood-stained phlegm and a pain in your chest especially when you cough or breathe in. The main causes of lung cancer are smoking; passive smoking; asbestos exposure and exposure to high levels of radon gas. Cancer prevention manager at the Irish Cancer Society Kevin O’Hagan said: "We need Irish people to start talking about it and to consider it important enough to take action. We need doctors and pharmacists to keep lung cancer front of mind and to encourage their patients to maintain good lung health. When it comes to lung cancer, awareness and early detection are the key to survival," he said. Smokers looking to quit smoking can call the HSE Quit Team on Freephone 1800 201 203 or Freetext QUIT to 50100.